In the current ocean of survival games, most inspired by the Minecraft phenomena, it’s hard to find something that truly stands out as an original product. I was skeptical myself with Don’t Starve. Few games have charmed me almost instantaneously. In the first few minutes of game play, I was already seeing myself hooked to this masterpiece for ages. What makes this game different is, above all, it’s beautifully crafted Burtonish universe, full of mystery and twisted creatures. It doesn’t seem like a ripoff of other similar worlds and it does so to perfection. The detail to dialogue for each character for example, is prove of the careful consideration that the developers took to make this game. The art style and animations are simply a joy to look at and interact with. There is something called game-feel and this game executes it perfectly. I would go as far as saying that this 2D approach is more satisfying than Minecraft itself. I would usually not enjoy games where dying is so punishing; it may come suddenly, and you will be losing all of your progress, without a chance to save any of it. However, for some reason, it just works. Maybe it’s the unique experience you get from every run, or the fact that the game is warning you from the start that this is not going to be an easy journey. 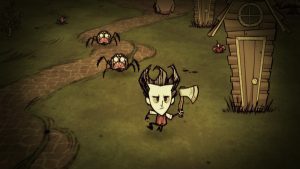 Don’t Starve will be remembered as a long-standing monarch of the survival genre.